The summer Backlog Attack continues as the July round begins! Did you crush your backlog games in June? Keep the momentum going this month to secure your place as Backlog Champion 2016! Didn’t do so well? (Too busy hosting a podcast, maybe?) You can still catch up! A new month means it’s time to put up a new slate of games to complete over the next few weeks! Returning listeners/players: Once again, just post the games you’ll be playing this month in the comments below! As an additional challenge this month, we want to see your screenshots, whether it’s a classic “THE END” screen, or just photographic proof that you’ve conquered something you’re playing. You can tweet it to us @vghangover, share it with us on on Facebook, link it in the comments below, or just email it to contact@vghangover.com. 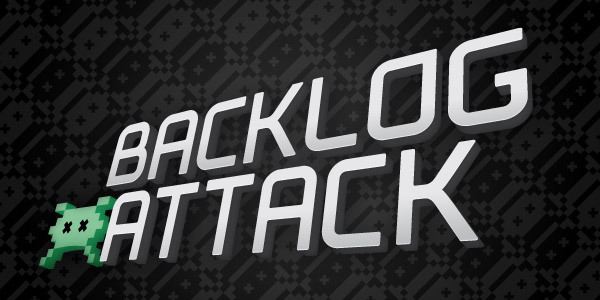 Are you new to the Backlog Attack this month? It’s a great time to join in! You can get the full contest details in June’s post, but basically: make as much progress completing your gaming backlog this month for a chance to win prizes at the end of the summer, including the new Fall release of your choice. 1) Panzer Dragoon Orta: My last OG Xbox game! I haven’t used my 360 in several years (not since Alan Wake a couple Backlog Attacks ago, actually) so I hope it doesn’t immediately burst into flame when I try to turn it on. 2) Eat Lead: The Return of Matt Hazard: A tongue-in-cheek 3rd person shooter starring Will Arnett as a washed-up video game hero. I’m fully expecting this to be awful, but hopefully the novelty of Will Arnett being there will be enough to get me through it. 3) Mayyyybe a few unfinished chapters of Last Window that I didn’t get to in June. Stiiiiilllll playing Last Window, evidently very slowly, which is going to make August interesting because I’ve picked a substantial game from my remaining backlog. Dang that Divinity is supposed to be pretty massive. Good luck! Im already 1/3 of the way through. Going to try to finish it! Doom has been conquered screenshots coming soon. original plans were to play blades of time and overlord. Then the steam summer sale happened. I picked up the binding of Isaac afterbirth and rebirth, and slime rancher. Isaac has taken up all of my time gaming after the kids have gone to bed, and Slime ranchers is the only game the kids want to play. i have managed to play some overlord, but the buggieness of the minions, and the lack of a map that tells you where your lost minions are, has started to make the game a bit of a chore. There is some good humor in the game, and if everything worked like it should, the game would be awesome, but the frustrating moments, when you have no control of the main draw of the game almost makes it unplayable. Slime rancher is in early access, so much of the game is not there yet, but the slimes are as cute as all be. There is potential for the game, but I have been burnt on so many early access games, I will reserve enthusiasm. I think at the current price of 20 bucks it may be a little high for the content that is out there, but there is a definite potential for greatness. My kids who are all under 10 think it is the greatest game ever, and it dominates our dinner conversations, so the younger gamers in your life may have a stronger draw to the game. The binding of Isaac is probably a game that would draw you in if grew up in the nes snes period of gaming. It is a rouge lite/like (only heard it said not spelled). My wife calls it the zelda game because it is a top down view game that focuses on a room of baddies at a time like the nes zelda game, and you have an inventory of bombs and keys, and a heart bar like zelda, but the twist is that it is a different run with different power ups that interact with each other in different ways, This game will stay in my rotation, and for the price tag of 15 bucks for the base game, and 10 bucks for the dlc it is well worth the price of admission. Good to hear at least your kids are into Slime Rancher! I’ve heard a lot of similar impressions about the game feeling incomplete… hopefully it’s in better shape once it gets out of early access. For June I finished (1) PS All Stars Battle Royale (2) the P.T. demp; and (3) Uncharted 4 (which I cheat included since I owned it for a week before June but hadn’t gotten a chance to start it; therefore backlog. Q.E.D). I also played quite a bit of (4) Dying Light and (5) Stealth Inc 2. For July I’ve already finished Stealth Inc 2 (qualified all the non-hidden chambers completed and each completed chamber with a rank B or better score as being completed) and I’m closer to Dying Light’s ending. (c) Talos Principle as a stretch goal. 3D Land is great! The last bonus level is supposed to be one of the toughest ever… Finishing that would definitely be a feat. So you’re telling me I should jump back into it? I found the first play through sort of unsatisfyingly easy and I got at least 2 coins in most levels my first play through and three in a large % if not the majority. I found the first part of the game to be pretty easy until the very end, but then the second world (or whatever unlocks after you “finish” it the first time) was considerably tougher. BUT there’s a secret level that unlocks if you clear every stage as both Mario and Luigi and have all the big coins. I’m nowhere near that point so I haven’t gotten to try it, but I’ve heard of people spending many hours just trying to finish it. 2) “completely” finished Super Mario 3D land. For 3d land I was going to just finish the mail worlds, but I started looking into the special words after D.J.’s comments, and then, obsessively pursued all star coins and flags for each level, and beat the final level… for the final level I dumped over 6 hours into it alone. I went in pretty blind and tried to be stubborn and use no items for many of those hours. In the end, I had a raccoon leave stored that I used 2/3 of the way through the board. Finished Alpha Protocol in June. Finished Far Cry 3 and Minecraft Story Mode in July. If you have given up on TWEWY, just send it my way. 🙂 I’ve been wanting to get that game and I just got a 3DS this last Christmas. If you couldn’t beat Persona 3 in 80 hours, just give up on Persona 4 now. Put your 100 hours of time into several other games. 🙂 Seriously though I liked the character interactions and Yosuke felt like my best friend in the game. How was Minecraft? That’s probably the next Telltale game I want to check out. I enjoyed it, mostly because it was something I shared with my son. Patton Oswalt does the voice of the male main character. I can only compare this to The Walking Dead season 1, and Minecraft is a much lighter more kid friendly story. Therefore it may not appeal to most adults. Speaking of TWD, I need to play season 2 after I finish Hitman.